Following up on our theme from last week's Artist Spotlight, today we bring you an interesting new invention that will help art conservators inspired by geckos (yes, the tiny adorable lizards!). For those of you unaware, geckos have a remarkable ability that is unlike almost anything else in the animal kingdom: they can walk straight up walls and upside down across ceilings, no matter the surface is made of. Even the smoothest glass is no impediment to them, thanks to a series of microscopic structures that adorn their feet in the millions. This allows them to get a tight grip on virtually any surface, and it has inspired a number of inventions in the scientific community. As with almost any old things, whether it's junk in the attic or a priceless masterpiece, fine art tends to attract dust when put on display in a gallery or museum. Not out of any odd properties, but simply due to the fact that no matter how good your ventilation system, it's impossible to keep 100% of the dust out of the air. This poses a large problem for art conservators, especially when the works they are tasked with protecting are already extremely fragile. Even the gentlest cleaning cycle over a long enough timescale has the risk of introducing flaws into paintings. In a brand new twist, scientists have developed a material that very closely mimics the microscopic columnar structures that give geckos their unique climbing abilities. Instead of being adhesive in any way, which would naturally damage the artwork dramatically, the sheets of the new and as-yet unnamed material are extremely flexible, and can attract dust with a simple gentle tap. They contain a very slight electrostatic charge, which enables even the very smallest particles of dust to be immediately captured and removed safely. Cindy Schwartz, an art conservator at Yale University explains: "Acrylic paints are incredibly porous, so anything you’re putting on the surface could get into the pores, and then work from the insides of the pores to soften the paints." Whether or not this will remain a tool for art conservators is as yet unknown, as the material still hasn't made its way to the general public just yet, but it's only a matter of time. 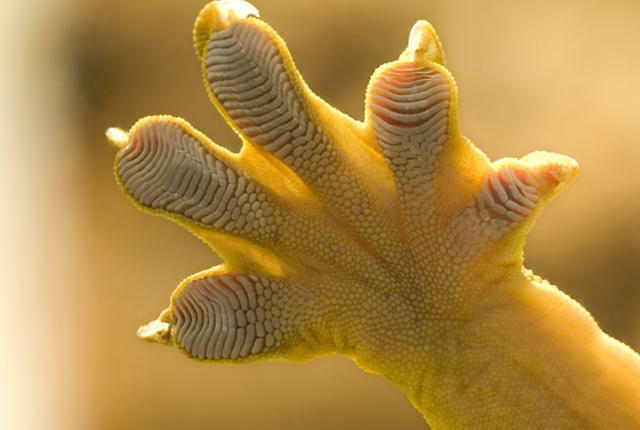 As for me, though, I'm holding out for gecko gloves to scale any surface with ease. One day.